Piazza Vittorio Emanuele is a city-block-sized park one metro stop southeast of Termini. Yes, that's right, it is nowhere near the Victor Emmanuel Monuement, which has Piazza Venezia in front of it. Those fun-loving Romans! They just love to confuse the tourists! Piazza Vittorio Emanuele contains two sites of interest: the ancient Trophies of Marius fountain, and Futelli's Fish Fry, which was originally designed as the central statue in the Fountain of the Naiads. 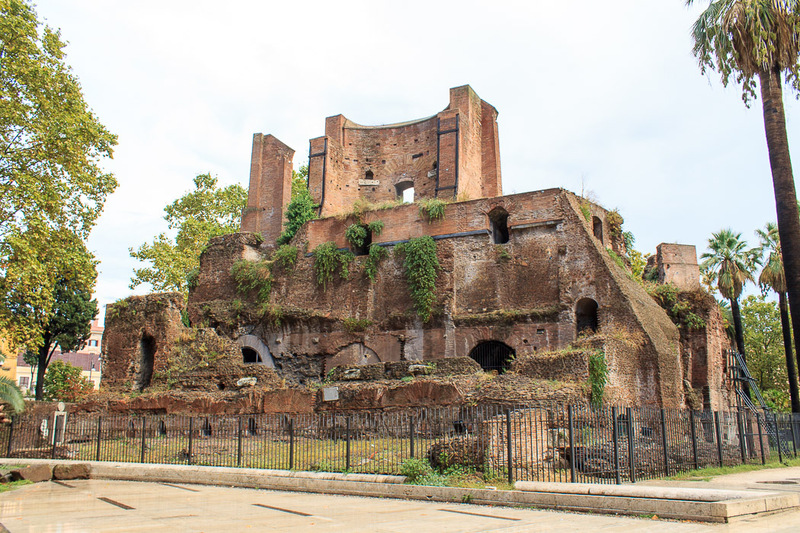 The Trophies of Marius is a large monumental fountain which was built inside an imperial villa at the time of Emperor Alexander Severus (222 - 235 AD). 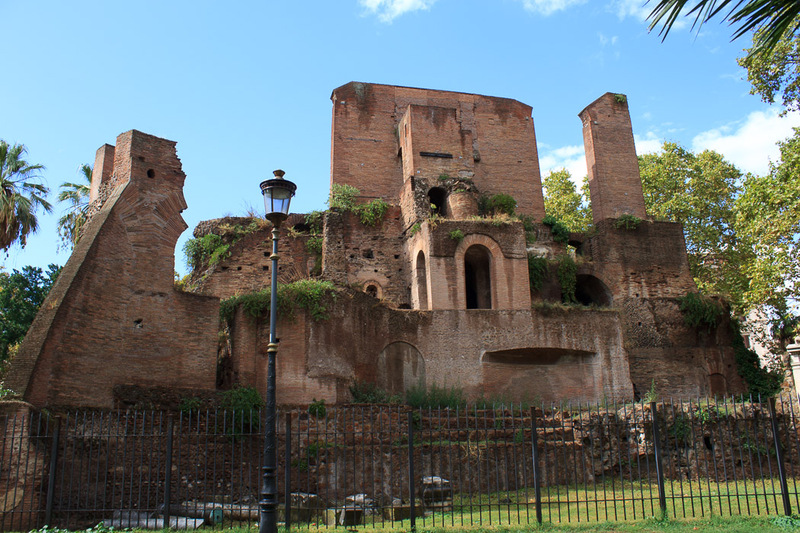 The Aqua Julia, built by Agrippa in 33 AD by order of Augustus provided water for this fountain, which stood 3 stories tall. The entry point of the aqueduct is still visible (see the arch in the 2nd photo below). The fountain had a large central niche (1st photo below), probably housing a statue of Alexander Severus, with a smaller niche on either side which contained the marble statues known as the "Trophies of Marius". 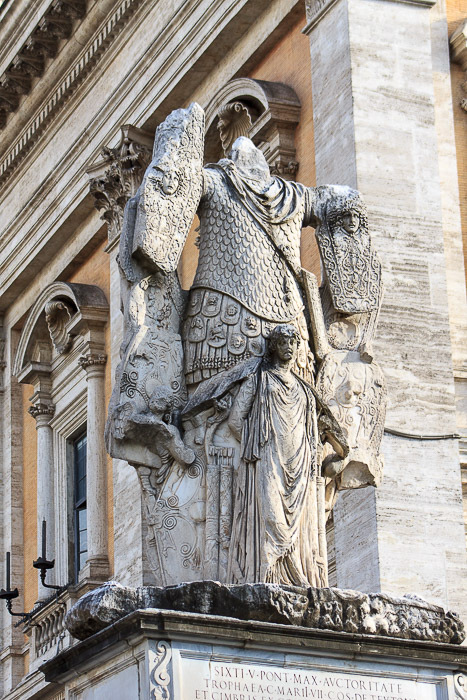 Those statues actually date back to the time of Emperor Domitian, and were moved to the ballustrade of the Piazza del Campidoglio by Pope Sixtus V in 1590 where they still stand today (3rd photo below). The fountain was made of brick covered by snow-white marble and various sculptures. A chariot stood on top of it. In addition to its purpose as a monumental fountain, it distributed water from the main input pipe into multiple secondary channels. Water would gush down from a basin near the top into niches with statues from which it gushed out again into a large semicircular basin at street level. This fountain inspired baroque artists in designing the monumental fountains we still see today: the Moses Fountain, the Big Fountain, and the Trevi Fountain. See all Trophies of Marius photos. When the Sicilian artist, Mario Rutelli, sculpted the statues for the Fountain of the Naiads he saved the central sculpture for last. 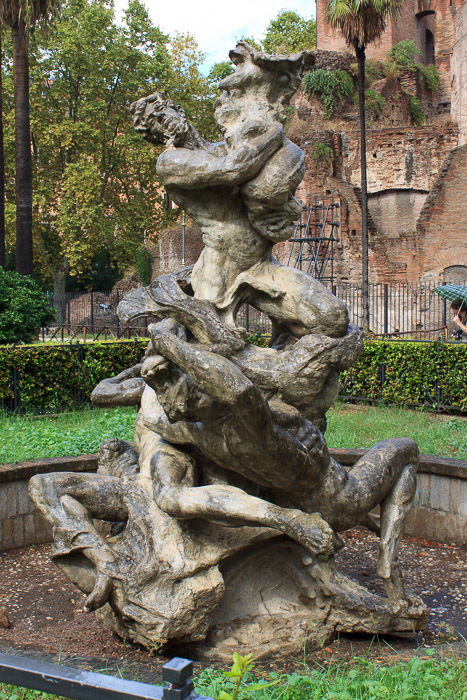 Rutelli, probably disappointed by the lack of universal admiration for his work, sculpted a bizzarre group that featured three human figures, a dolphin and an octopus tangled together in a wrestle, and unveiled a model of it in mortar in 1911 before he sculpted the final version in bronze for the center of the fountain. The reception was poor, though, with the people nicknaming it "the fish fry of Termini". Rutelli went on to sculpt the more conventional group that stands on the fountain today: a single male figure embracing a dolphin. The "fish fry" can be found today in Piazza Vittorio Emanuele. In my opinion, it's a pretty awesome statue and would have been great in the center of the Fountain of the Naiads. See all Rutelli's Fish Fry photos.